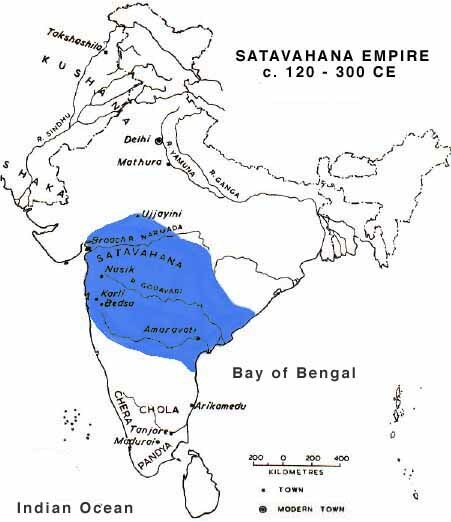 The Satavahanas appeared as the successors of the Mauryas in Deccan. The Puranas list thirty kings of the dynasty ruling for over 460 years. The Satavahanas were known as Andhras, Andhrajatiyah and Andhrabhrityas in the Puranic list. Some historians suggest their place of origin was in Maharashtra. Two inscriptions of the Satavahanas, i.e. the Nanaghat and the Nasik inscription have been discovered in Maharashtra. The Most interesting details about the Satavahanas relates to their family structure. It was customary for their king to be named after his mother. Such names as Gautamiputra and Vasishtaputra indicate that in their society, the mother enjoyed a great deals of importance. Kanva Ruled between 207-189 BC, as per the Nasik inscription. Satakarni I son of Simuka, took the title of Dakshina Patahapati. Sri Satakarni II Ruled for 56 years. Hala AD 20-25, 17th ruler of this dynasty, composed Gatha saptasati. In the Satavahana phase, many temples and monasteries were cut out of the solid rocks in the North-Western Deccan or Maharashtra with Great Skill. The Common structures were the temples, which were called Chaityas and the monastery which was called Vihara. The Stupas of Amaravati and Chaityas of Karle were the most Important.